Shell Armor The Pok�mon is protected against critical hits. No moves will critically hit this Pokemon. Skill Link Increases the frequency of multi-strike moves. This Pokemon always hits five times with 2-to-5-hit moves. Red/Blue Its hard shell repels any kind of attack. Ruby/Sapphire At night, this POK�MON uses its broad tongue to burrow a hole in the seafloor sand and then sleep in it. Emerald At night, it burrows a hole in the seafloor with its broad tongue to make a place to sleep. 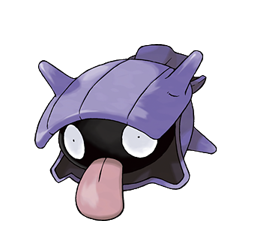 While asleep, it closes its shell, but leaves its tongue hanging out. Leaf Green Its hard shell repels any kind of attack. It is vulnerable only when its shell is open. Diamond/Pearl It swims backward by opening and closing its two shells. Its large tongue is always kept hanging out. Platinum It swims backward by opening and closing its two shells. Its large tongue is always kept hanging out. Heart Gold It swims facing backward by opening and closing its two-piece shell. It is surprisingly fast. Soul Silver Grains of sand trapped in its shells mix with its body fluids to form beautiful pearls. Black It swims backward by opening and closing its two shells. Its large tongue is always kept hanging out. White It swims backward by opening and closing its two shells. Its large tongue is always kept hanging out.